Exclamation Point, a 3-year-old half-brother to champion and 2017 Arkansas Derby winner Classic Empire, is probably headed for two turns following his front-running 2 ½-length career-debut victory in Saturday’s fourth race at Oaklawn Park, trainer Brad Cox said Sunday morning. Under Fernando De La Cruz, Exclamation Point covered 6 furlongs over a fast track in 1:10.56 and paid $7.40 as the second choice in the 10-horse field. Cox noted Exclamation Point won despite being “a touch worked up in the post parade” and switching to his left lead inside the sixteenth pole after being hit right-handed. 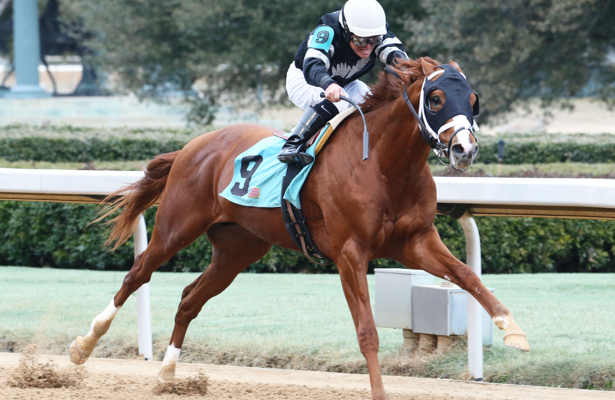 Exclamation Point, a chestnut son of Concord Point, is a homebred for Steve and Brandi Nicholson, who were in Hot Springs for the colt’s debut. The couple purchasedSambuca Classica (the dam of Classic Empire and Exclamation Point) early in her racing career before she starred as a broodmare at their Silver Fern Farm near Versailles, Ky. Sambuca Classica is a 14-year-old daughter of Breeders’ Cup Classic winner Cat Thief. Classic Empire debuted in May of his 2-year-old year en route to an Eclipse Award in 2016. Shin issues interrupted Exclamation Point’s training for approximately six weeks last fall, delaying his career debut. Cox began training last summer for the Nicholsons, who sold Classic Empire for $475,000 at the 2015 Keeneland September Yearling Sale. The now-retired Classic Empire recorded his final career victory in the Arkansas Derby for trainer Mark Casse. A son of Pioneerof the Nile, Classic Empire was a unanimous choice for champion 2-year-old male of 2016 and now stands at Coolmore America’s Ashford Stud in Kentucky.